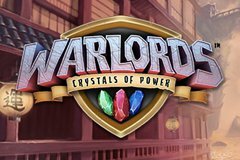 Warlords: Crystals of Power is a slot machine created by world’s famous online gambling soft developer NetEnt released in 2016. This game based on an ultra-popular computer game that got cult status in its genre and gaming world at all. Casino slot is also great: this is incredibly spectacular and exciting game saturated by unforgettable adventures in an amazing fantasy world, where good and evil have clashed in a deadly battle. Warlords Bitcoin slot became popular in a short period of tame too for its amazing graphics, unique bonuses and many other advantages that we are going to describe right now. The game design is based on the source game, but unique graphic elements are presented here. The visual design partially corresponds to the grim game setting, but in general it looks very nice and harmonious. We came to win money and have fun, and not to fight desperately. The main thing is that the spirit of fantasy is perfectly embodied in bright colors and details of each element of the game: the backs, functional buttons etc. “Warlords” has the same interface as all popular NetEnt projects, but includes some special details. Control panel here become even more convenient and functional. Players can choose bet amount in coins; there are presented automatic and manual reels’ launching. Options allow you to adjust the speed of the game process, the quality of graphics, sound, screen size and other useful things. In addition developers can present you rules section with answers for all game’s questions and detailed paytable. All schemes of combos and prize functions demonstration are available. Both browser desktop and mobile versions are available. Warlords: Crystals of Power contains 5 reels and 30 constantly-used bands. Each turn show us 15 pictures placed in 3 rows. Spin bet has 10 levels and always can be divided by 15. Also the game has special game elements, free spins with extra features, additional prize functions. This machine is implemented for winnings in the maximum number of ways. The winning sequence is made up of 3, 4 or 5 identical pictures on active lines, and the same pictures should be near. Two parameters determine the amount of winnings: the bet on the line and the multiplier of a particular combination, which varies from 3 to 300. Within a single turn, several winning combinations can be dropped (they’ll be summed). ‘Scatter’ is a flags with no money value, but it activates free spins and other bonuses. The assortment of bonus games is wider in comparison to other popular bitcoin slot games by NetEnt, and it is noticeable that the developer made the main focus on this here. The main prize function is called Random Overlay Wild, and it contains three game types with different winnings: The Barbarian Hammer, The Priestess Arrow, The Samurai Sword. Also here free spins, re-spins and some other additional bonuses are regularly available. Before starting the game, it’s better to study all the features in the free demo mode, it will be useful. This is a great game with perfect design and gaming ideas, impressive graphics and incredible additional features. There’s more features in comparison of other popular slots by NetEnt, but you’ll understand it quickly It is full of features in a somewhat larger volume than other similar slots, but you will understand quickly, and you will win a lot in the long term: here the average level of theoretical return was implemented here. Chose best bitcoin casino for Warlords slot on our website!